Mayor Michael Nutter on a conference call accepting the nomination for the 2016 Democratic National Convention to be held in Philadelphia. Philadelphia will host the 2016 Democratic National Convention, officials announced Thursday at a City Hall press conference, capping months of wooing by local leaders. Mayor Michael Nutter, surrounded by media, took a phone call from DNC chair Debbie Wasserman Schultz to officially announce that the conference will be held in Philly. "The momentum in Philly — you can feel it," Nutter said during the conference call, which also included former Pennsylvania Gov. Ed Rendell. "We will deliver to you one of the best conventions in 100 years." Wasserman Schultz said the decision to award Philly the convention came down to three major areas: logistics, security and resources. "Philly really had the strongest bid in each of those areas," Wasserman Schultz said. Philadelphia, which hosted the 2000 Republican National Convention, beat out Columbus, Ohio, and Brooklyn, N.Y. The event is slated to begin July 25, 2016. The close proximity of the Center City hotels to Wells Fargo Center, where the major events will be held, was praised as a strength of the city's bid. The hotels also are located just blocks from the Pennsylvania Convention Center, where related events will be held, and within a vibrant restaurant scene. Nutter said the convention is expected to draw about 35,000 people to the region. The local economy could receive a $175 million to $225 million boost from the event, said Jack Ferguson, president and CEO of the Philadelphia Convention & Visitors Bureau, the marketing arm for the convention center. Rendell, who headed Philadelphia 2016, the nonprofit that put together the city's bid, said Philadelphia expects to raise $84 million for the convention. "We're confident we can raise that," he said. "We're going to try to get a little cushion in case there are contingencies." Nutter stressed that the city budget will not be on the hook for security costs and police overtime, noting the federal government typically awards a grant to the host cities to cover security expenses. He said whatever the federal government doesn't cover will be paid for by the host committee, noting that Philly -- predominantly Democratic -- raised $64 million for the 2000 RNC. "We want to raise all dollars and have it contained within what the host committee generates as well as the federal grant," Nutter said. "We have to have a secure environment. That's not a partisan issue. The (Republicans) want the same thing in Cleveland and we want the same thing in Philadelphia." The DNC will bring thousands of delegates and reporters into Philadelphia less than a year after Pope Francis visits the city for the World Meeting of Families, set for Sept. 25-26. "With the pope coming to Philly and now the DNC, this is just an extraordinary acknowledgment of the world-class city we call home," U.S. Rep Chaka Fattah said. “Today’s announcement that Philadelphia, the birthplace of our democracy, will host the 2016 Democratic Convention is tremendous news for the Commonwealth of Pennsylvania," said Pennsylvania Gov. Tom Wolf. "This opportunity will generate hundreds of millions of dollars in economic activity in the state. 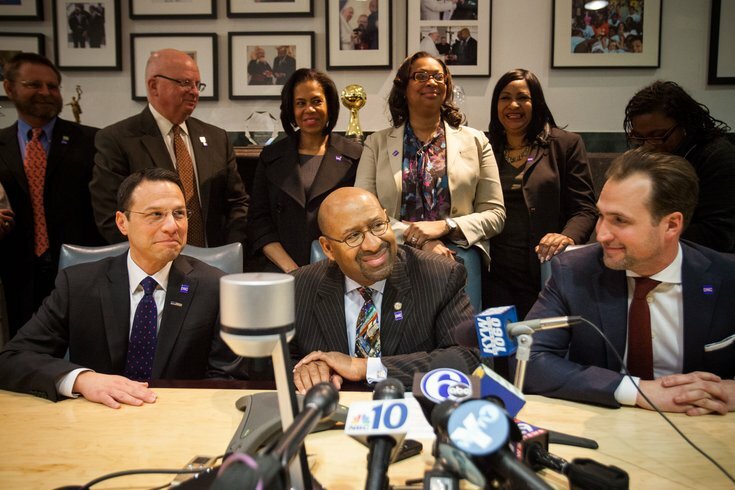 We look forward to working with local leaders to ensure that Philadelphia will shine in the national spotlight." In a press release from Nutter's office, Wasserman Schultz said a final contract with the city was signed Thursday morning. “The city of Philadelphia is excited and honored to be selected as the host city for the 2016 Democratic National Convention,” Nutter said in the statement. “We believe that it was our proven track record of hosting big events safely and efficiently with a dynamic team of top-tier professionals to organize and manage a conference of this magnitude, paired with our city’s tremendous amenities, its accessible location and historical significance, which made Philadelphia the ideal choice for the 2016 DNC." In addition to the statement, Wasserman Schultz was shown in a video posted to the Democratic Party Facebook page walking to a refrigerator, pulling out a cheesesteak and slapping a Philadelphia magnet on the fridge while "Eye of the Tiger" played. The Pennsylvania Democrats reacted to the announcement via Twitter. Lily Adams, a deputy director of communications for the Democrats, also tweeted the news. Lane Blackmer contributed to this post.